Should I buy real estate now or should I wait a little longer? Sometimes home buying seems too expensive, sometimes it doesn't fit your current life situation, sometimes you feel unsure. The right time for purchasing real estate needs to be carefully considered. Key factors include your personal situation, the conditions of the mortgage – especially the interest – and the situation on the real estate market. The latter is subject to periodic fluctuations of supply and demand, which have a major influence on real estate prices. downturn, recovery, expansion, and slowdown. 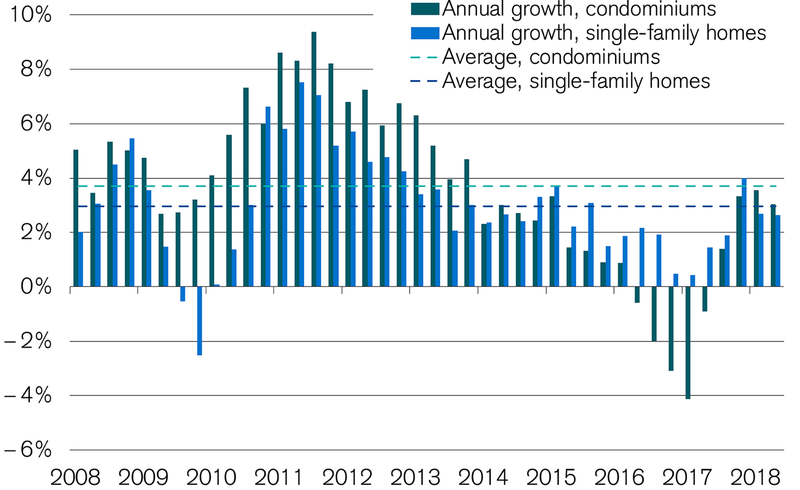 In this way, a recession due to rising unemployment, lower purchasing power and investment readiness on the part of households and companies, for example, can trigger a drop in the demand for real estate. As a result, supply outstrips demand. Real estate prices decrease. If the price decline weakens and prices bottom out, the market begins to stabilize. Because of low demand, there is a lack of investment in housing. Demand and supply become equal. Real estate is attractive due to the low prices. In the expansion phase, demand begins to increase again. At some point, the relatively small supply of residential property no longer meets the need. Real estate prices increase. Investors start investing in residential construction; new properties are built. Then comes the slowdown. Demand peaks at some point and remains constant. Housing, however, keeps increasing. There is an oversupply of residential property. Accordingly, real estate prices decrease again. 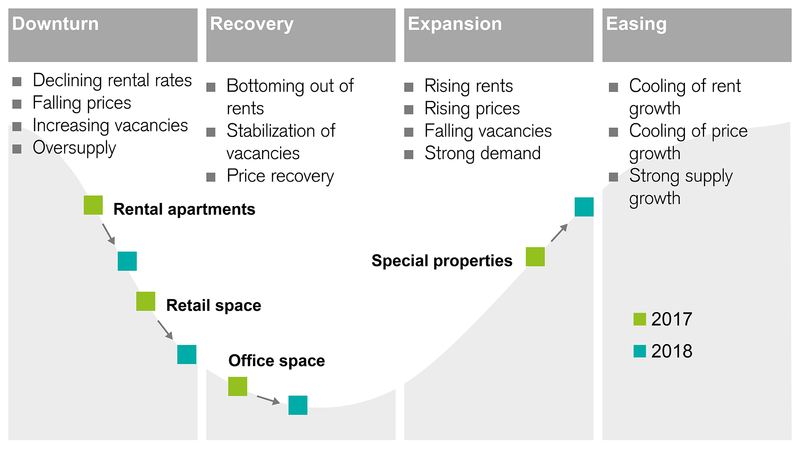 The four phases illustrated using commercial real estate. The four phases are not regular and are not always similar. The real estate market cycle may or may not be parallel to the economic cycle. It may be that prices are rising even though the economy is in recession. Roughly, the cycle can be divided between recovery and slowdown of the real estate market. The recovery period generally lasts longer than the slowdown phase. In terms of real estate prices, the best time for buying a home is during real estate market recovery, when the prices are no longer decreasing, but have not yet started increasing. Choosing the right mortgage is important for financing real estate. 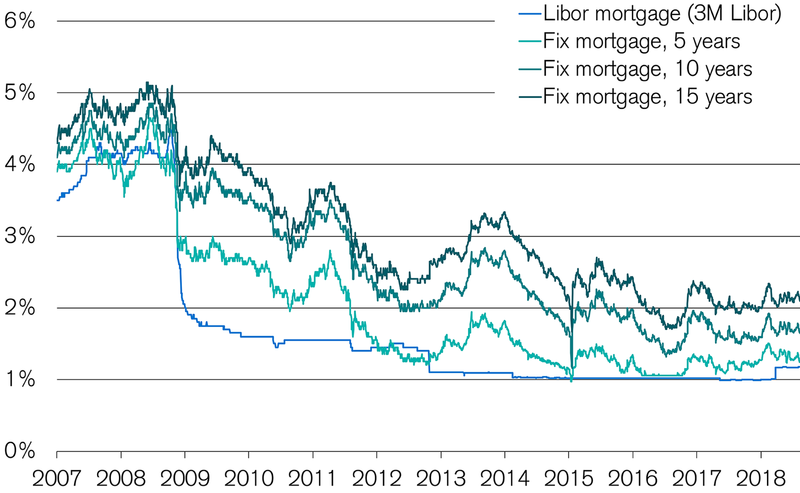 Mortgage interest rates play a key role in this regard. These vary depending on the general interest rate situation, mortgage model, the term of the mortgage, and the borrower's creditworthiness. The interest rate is based on conditions on the money and capital markets. The risk assessment by the bank and the term of the mortgage also affect the interest rate. The biggest factor for mortgage interest rates is the interest situation on the market. It is therefore important to closely observe economic developments when it comes to financing the desired property. Find out more about mortgage interest and the daily interest rates. In addition to external factors, such as real estate prices and mortgage conditions, personal aspects, in particular, play a major role. This includes the financial background. Do you actually have enough capital to purchase a home and maintain it for the coming years? Are you planning to start a family? In that case purchasing a smaller apartment, for one to two people, would not be worthwhile. Professional goals, travel plans, or large purchase plans should also be taken into account before buying a home. Would you like to go abroad for an extended period in the near future? Or are you planning to pursue professional development or further education, during which salary reductions must be expected? In such cases, it might be better to wait to buy a home. There is no reason to let yourself be unsettled by prices and interest rates. The important thing is to clarify your own situation and to educate yourself about the real estate market cycle and the economy. Banks constantly publish forecasts for interest rates and for real estate market development. One thing is clear: Even before these factors come into play, your personal situation and needs are key in determining the right time to buy a home. We would be happy to help. Call us at 0844 100 114.